Wedding Photo Swap provides a simple, yet elegant solution, to collecting and sharing all the photos taken at your wedding. Get a live feed from your guests photos of your day, so you can relive more of the moments that made their day - and yours - so special. Create your own personalised space for your guests to add photos. You can add an unlimited number of albums for each part of your wedding, you could even try out the app for your hen or stag do! Using our guest manager you can invite guests by email before your wedding (through the app or website), or you can print cards pre-filled with your guest access details to add to your invites. These can be sent to the guests with the wedding invitations, or you could have them available at the event - for example on your tables. Relive your wedding from all your guests of points of views. During your wedding, the feed comes to life with photos and comments by family and friends in a beautiful visual timeline. 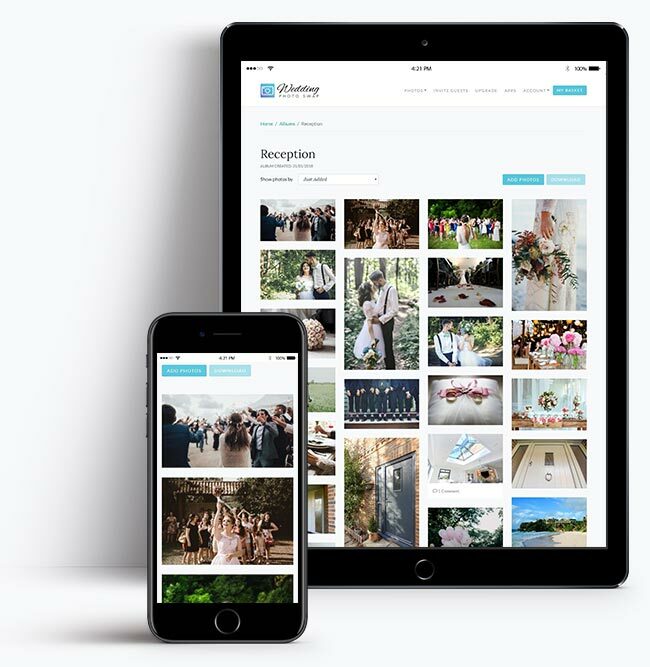 All the photos uploaded to Wedding Photo Swap are saved in high resolution so when you have collected all the photos from your wedding you can simply choose to download them all or order beautiful prints of your wedding. Great app, we got so many photos from our guests. Don't have a wedding without this app, we got to see tons of photos from all angles that we would never have seen without this app, all our special moments and some surprising ones too, and everyone enjoyed seeing them all. Awesome!